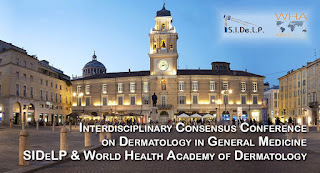 Home / 2018 / Abstract / ADI / ADMG / Congresso Internazionale ADI-ADMG / Combined cell and gene therapy of junctional epidermolysis bullosa. Combined cell and gene therapy of junctional epidermolysis bullosa. Centre for Regenerative Medicine “Stefano Ferrari”, University of Modena and Reggio Emilia, Modena, Italy. Junctional Epidermolysis Bullosa (JEB) is a severe and often lethal genetic disease caused by mutations in genes encoding the basement membrane component laminin-332. Surviving patients with JEB develop chronic wounds to the skin and mucosa, which impair their quality of life and lead to skin cancer. JEB is the first genetic disease targeted by transplantation of epidermal cultures originated from transgenic epidermal stem cells. Three patients were treated with autologous epidermal cultures transduced with a MLV-derived retroviral vector carrying the LAMB3 cDNA under the control of the viral LTR. Several skin biopsies were taken from each patients to perform histological analysis, immunofluorescence, in situ hybridization and genome-wide analysis of the retroviral integration sites. The regenerated epidermis was normal-looking, remained mechanically stable throughout the entire follow-up period and did not form blisters, even upon shear force. We observed a proper expression and location of laminin 332 in the basal lamina. In situ hybridization performed using vector-specific LAMB3 probes showed homogenous expression of LAMB3 mRNA in all epidermal layers, confirming that the regenerated epidermis consists only of transgenic keratinocytes. Histological analysis showed a normal and fully differentiated epidermis with a normal dermal-epidermal junction. Electron Microscopy confirmed the presence of well-defined, organized hemidesmosomes comparable to those of healthy controls. In particular, we report life-saving regeneration of the entire epidermis on a seven-year-old JEB child suffering from a devastating form of JEB. The proviral integration pattern was maintained in vivo and epidermal renewal did not cause any clonal selection. Clonal tracing showed that the human epidermis is sustained not by equipotent progenitors, but by a limited number of long-lived stem cells, detected as holoclones, that can extensively self-renew in vitro and in vivo and produce short-lived progenitors that replenish terminally differentiated keratinocytes.